Q? What if I receive a set from you, and one of the tiles is missing? A. We take all precautions to ensure this does NOT happen. That’s why all new sets are sent out in shrink-wrapped bricks. Each brick is inspected before it is sent to you. There are 40 tiles in each brick, and the extra 2 jokers and 4 blanks will be in a separate Ziploc bag, making a total of 166 tiles in an American set. When you open the tiles, make sure you CUT the shrink wrap, and do not “break bread” with the bricks to open them. If you do that, tiles will fly out and you might misplace one. WE CANNOT SEND YOU ANOTHER ONE IF YOU MISPLACE ONE. You will have to use one of your blanks to have it re-engraved to match your set. OPEN THEM CAREFULLY! Q? How do I get a tile re-engraved with one of my blanks? 3) Put the tiles into a PADDED envelope and send it USPS First Class Mail WITH TRACKING. This should cost no more than $3.00. We do not engrave tiles that were not purchased from Where The Winds Blow. Q? I am interested in ordering something that is out of stock. What do I do? A. Make sure you are on our email list! That is the best way to be notified when products come back in stock. Contact us directly if you want to prepay for an item. Q? What if I order tiles and I don’t like them? A. We’re happy to exchange your tiles or offer a full refund. There is a $10 restocking fee, and you pay the shipping to return the tiles to us. That’s why we offer example tiles! A. Click the Return Policy tab in the panel to the left or you may CLICK HERE to be immediately directed to our return policy. Q? Can I pay by check? A. We do not accept payment by check. Q? : What if I ordered tiles and the colors aren't what I expected? We do our very best to make sure our photos are an accurate representation of what you are purchasing. Because of that the photos may appear slightly less vibrant based on the device you are using. Devices with higher resolution will be more accurate while devices with lower resolution will appear less saturated with color. Next time you visit a big box store, look at TVs next to each other you can see the TVs with more resolution are brighter and more realistic looking. We do not enhance the colors of the photography, we only put the products on a white background so their beauty can speak for itself. We suggest everyone take advantage of our example tile program to get your hands on some examples of what tiles you can purchase. This way you can customize with confidence! Q? How many tiles do the racks hold? A. Standard racks with brass ends hold 18 tiles, and the new combo racks hold 19 tiles. Q? What is the difference between standard tiles and jumbo tiles? Standard tiles are 1 1/8″ x 7/8″ x 1/8″. Jumbo tiles are 1 3/8″ x 1″ x 3/4″, and generally are not used with racks. Q? What is the difference between a standard rack and a combo rack? A. A standard racks comes with brass ends, and a combo rack has the pusher, or helping hand, permanently attached with a hinge. Q? How many tiles are in an American set? The blanks are in case you lose or break a tile, you can have it re-engraved at a cost of $20 per tile. As for the ones that most people play with, they include 36 dots, 36 bams, 36 craks, 16 winds, 12 dragons, 8 flowers, and 8 jokers. So when you get your tile set, you should remove the 8 extra flowers, 2 jokers and 4 blanks before play. Q? What is the difference between an Asian set and an American set? American sets have numbers and letters on them, and include 8 jokers. Asian sets do not have numbers or letters engraved on their faces and the set does not include any jokers. Q? Are the sets hand-made? Most sets are not hand-made, but they are hand ENGRAVED and hand PAINTED. No two tiles will be exactly the same and there will be slight variations in the ENGRAVING. All the tiles (size, shape, color) will match, so you can play a good, challenging game! Q? Can I make substitutions for Special Value Sets? A. No. We do not make substitutions for special value sets. (Color change, bag change, etc..) Special value sets are always changing so be on the lookout for your favorites! Pro tip: We announce new special value sets, coupons and discounts in our newsletter. Sign up to receive these emails today! Q? How can I customize my set? Q? What can I get on my jokers? A. Send us a message letting us know what you are interested in and we will send you options. We have a large library of graphics. If there is something else you’d like that we don’t have, there is a $30 setup fee. Q? Can you help me put my set together? A. We’d love to! Give us a call at (281) 578-7571 during business hours. You can also take a look at our Idea Gallery and Font Tool for inspiration. If you would like to place your order over the phone there is an additional $5.00 service fee and your order may have additional processing time. Q? I am having trouble figuring out how to add custom jokers to my order. Help! 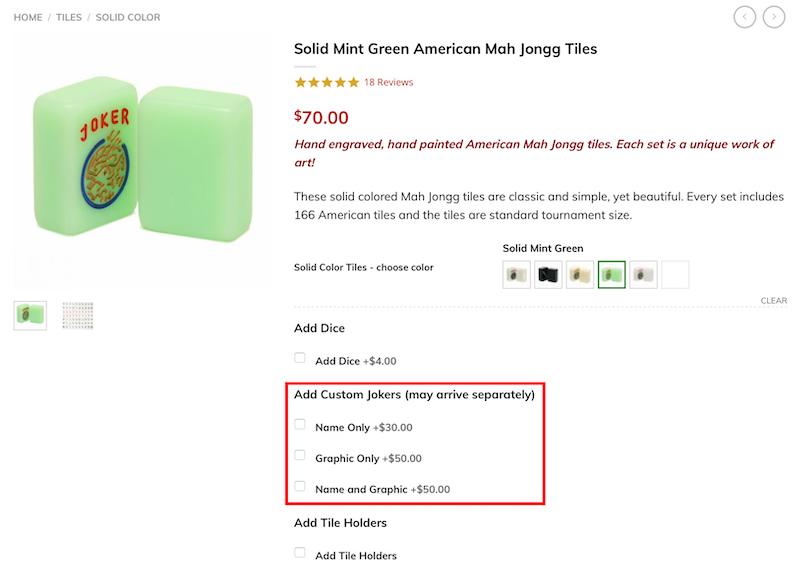 When custom jokers are in stock for a tile or special value set you will see the option to add them to your cart while you are on the tile product page. Availability for jokers is in limited supply and subject to change. You may see custom jokers available for purchase on Monday and they are out of stock by Tuesday. If you fall in love with tiles and want to add jokers make sure to act fast! If you have jokers or full set engraving with graphics, we will send you a proof. Additional proofs are $10 each. Proofs will not be supplied until your order comes through. Q? What if I want to get something different on each joker? A. In addition to the cost of the jokers, add $2 for each kind of engraving. So if you are getting 4 jokers with one kind of engraving and 4 of another, add $4. For 8 different jokers, add $16.00. Q? How much is it to engrave every tile of the set? A. This is very popular and makes the set a real treat to play with. The cost is $175 to have every tile of the set engraved. If you want customized jokers in addition to the regular jokers that come with the set, normal joker engraving rates apply. Q? What are the color options for custom jokers? You may select any of the following colors. These swatches were provided directly from our engraver. If you print your jokers, you can have any colors you want. Samples of our beautiful new printed jokers. Truly unique and expands your customization options as far as your imagination will go! Q? What if I want something special engraved, that is not in your graphics library? A. Please send us the image. There is a $30 setup fee, and we will send you a proof for your approval before engraving. Q? Can I see what my jokers will look like before they are engraved? A. Absolutely! Visit our Personalization page and see how your name, monogram, or other text will look. If you have something very specific in mind that includes a graphic, then we can send you a proof first. The first proof is complimentary. Edits to the proof cost an additional $10. Q? I have my own blanks, can I get jokers engraved? A. We only engrave blanks from sets that we sell. Contact us directly if you aren’t sure where you purchased your set. Q? What will the monogram engraving or embroidery look like? Monograms are done with your last name as the center letter. Visit our font tool to preview the fonts you are able to use for monogram. Q? Can you engrave blanks from a set I currently own? We only engrave blanks for Mah Jongg tiles we can replace. If we don’t sell it, we can’t engrave it. Q? Do you offer free shipping? We are now offering free shipping for all orders within the continental United States. Some restrictions may apply. A. Absolutely! International shipping generally runs about $30 for 0-5 lbs, and $70.00 for 5-10 lbs, depending on destination. At this time our website doesn’t automatically calculate international shipping. Please contact us with your shipping information for an accurate quote. Q? What does Free Shipping* mean? Q? How fast do phone orders ship? Great question! Your phone order will experience a processing delay, 7 – 14 days before shipping. Orders placed over the phone have a $5.00 service charge and are subject to additional processing time. Q? By what time do I need to place an expedited order for my expedited order to go out the same day? If you choose to upgrade to expedited shipping, your order must be placed by 12:30 PM to ship the same day. Expedited orders placed after 12:30 PM with expedited shipping will be shipped the next business day. If the expedited order is placed on Friday the next business day is Monday. Q? I don't like ordering online, do you take orders over the phone? We do! Phone orders are subject to a phone order fee of $5.00. Q? Will you walk me through ordering online? We can help answer your questions about products you are interested in purchasing from our website. If you would like us to take your order over the phone there will be a phone order fee of $5 and the order will take an additional 5-7 days to process prior to shipping. Q? Will my phone order process as fast as an online order? No. 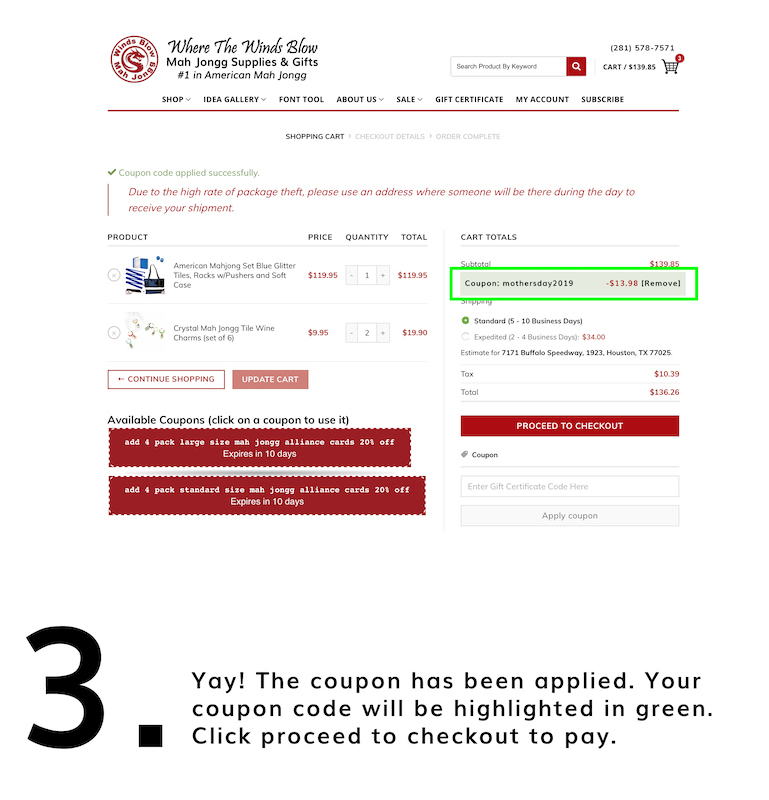 Ordering by phone will add 5 – 7 days processing time. Q? If I place a phone order will current discounts on the website apply to my order? Any new item purchased from us, which is in resalable condition, may be returned within 30 days of ordering for a refund, replacement, or store gift certificate. Shipping costs are not refundable. If you ordered something in error or changed your mind, or just simply don’t like it, the item may be returned within 30 days of purchase. You are responsible for the return shipping costs. The item must be returned to us with a tracking number. Once we receive the item at our facility in good, resalable condition, the original cost of the item will be refunded to you. The original and return shipping costs are not refundable. If an item needs to be repaired or replaced due to a manufacturer’s defect or error on our part, we must be notified within 30 days of receipt of the item. Return shipping costs will be reimbursed, provided they have been authorized by us in advance. Products under our imperfect product section are deeply discounted, playable products with visible blemishes. These blemishes are noted on the specific product pages. Imperfect products are non-refundable and non-returnable. No exceptions. PLEASE NOTE THAT UNDER NO CIRCUMSTANCES CAN PERSONALIZED ITEMS BE RETURNED. If returning tiles, the entire set of tiles, including additional blanks and/or jokers which came with the set, must be returned within 30 days of receipt of the item. The tiles must be sent well packed in bubble wrap with tracking. If the tiles are no longer in their original shrink-wrap, a $10 restocking fee will be charged against the refund. Returning tiles can be costly because of their shipping weight, so please take advantage of our EXAMPLE TILE SAMPLE PROGRAM. 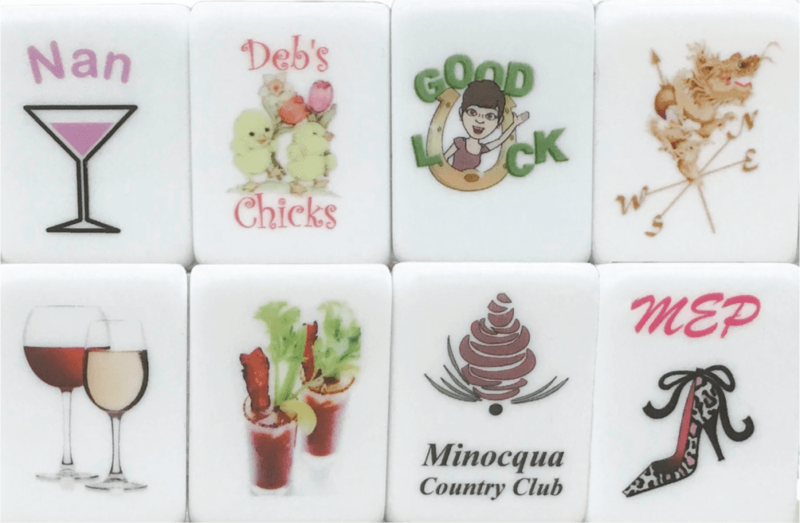 Select up to five example tiles which we will send you for $4.98 so you can see how they look before ordering a set. 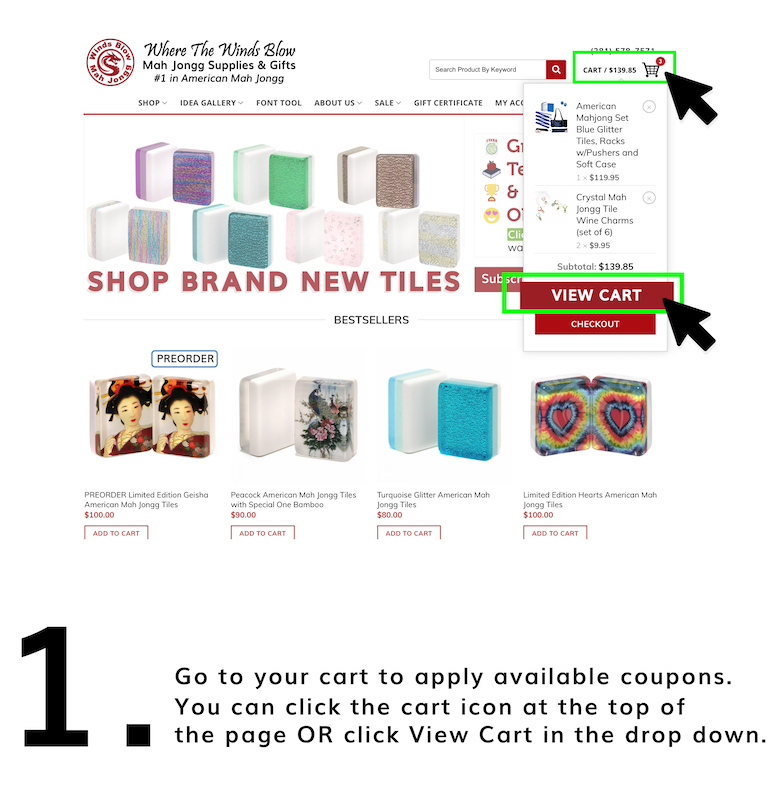 When we send your example tiles a coupon code is included for $4.98 off your purchase of tiles! This will avoid disappointment in getting tiles you may not like, which you will have to return. That way you will be happy, which will in turn make US happy! CLICK HERE TO ORDER EXAMPLE TILE SAMPLES BY PATTERN NAME. Q? I have an old set, can I get replacement tiles or jokers from you? A. Unfortunately, it is very difficult to match tiles to an older set because tile dye lots (for the same kind of tiles) can differ greatly. We can offer some resources for you. Please contact us directly. Q? How do you recommend caring for my tiles? A. Do NOT leave tiles in the car! Temperature changes can ruin tiles, and sets get stolen that way. Instead, keep them in a cool, dry, safe place. Clean with non-alcoholic baby-wipes. NEVER wash tiles with hot water, soap, or in the dishwasher. Do NOT use abrasive cleaners of any kind on the tiles. They are made with love and care, and should be treated that way. Q? What if I can’t decide which tiles I want? A. Let us know which ones you are interested in and we will be happy to send you up to 5 example tiles to look at first for a small fee. Return shipping on tiles can get expensive, and we would like you to be happy with the tiles you get the first time around. Please CLICK HERE to order your example tiles! Q? What can you do for tournaments? A. Contact us directly – there’s a lot of ways we can help with tournaments, and we love to help! Q? Do you offer wholesale pricing? A. YES! Use the Contact Us form on our Contact Us page and we will get in touch with you. You must have a valid reseller’s permit to see our wholesale pricing. Q? Do you offer special pricing for teachers? A. YES! We love our teachers! Please contact us directly for details. Q? What is the “Hand of the Month”? A. It is our Face book challenge! We post a hand from one or more of the national cards, and if you are one of the first 10 to win the hand, then take a picture and send us the picture with your address. We’ll post your picture on our page, and we’ll send you a surprise gift! Q? Do we need an appointment to come to the warehouse? A. We prefer that you make an appointment beforehand so we can be sure to have salespeople on hand to assist you. But if you find yourself in the neighborhood, or need something right away and are close-by, please come see us. Please take a look at the website and let us know what you want so we can get it ready for you. Q: Can I come shop in store? If so, what are your store hours? Absolutely! Come visit usbetween 9:00 AM – 3:00 PM Monday through Friday. Our hours are subject to holiday closure. Holiday hours will be posted on the website as applicable. Q? How can I learn Mah Jongg? A. We recommend learning Mah Jongg in a small group with a teacher. Visit our teacher’s page to find one near you. If you ARE a teacher and want to be added, please send us your name, location, and email address. 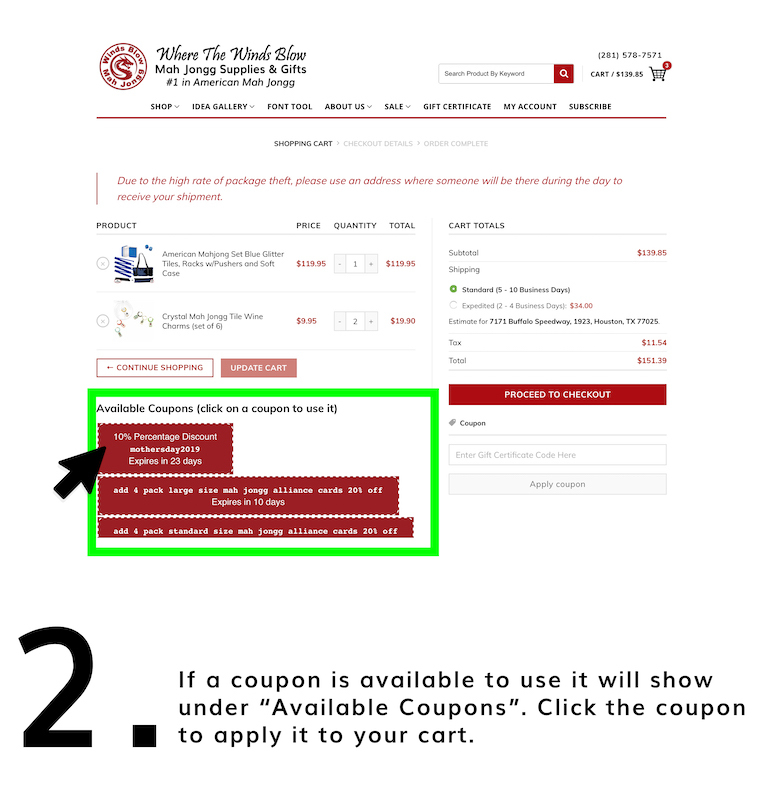 Add a coupon to your cart in three easy steps!